Preheat the oven to 350F. Spray with oil, or butter a 9x5x3 loaf pan. In a medium bowl, whisk together 1 1/2 cups flour, 1 tsp baking powder and 1/4 tsp salt. Use an electric mixer to beat 6 tbsp butter until softened, then add 3/4 cup granulated sugar and continue beating until light and fluffy. Add 2 eggs, one at a time, beating in well. Stir in 1/2 tsp vanilla extract and 1 tbsp lemon zest. Turn the mixer to low to add the flour mixture and 1/2 cup milk, alternating additions to begin and end with the flour. Mix only until combined, then gently fold in about 2/3 of the blueberries. I used a pint of blueberries. 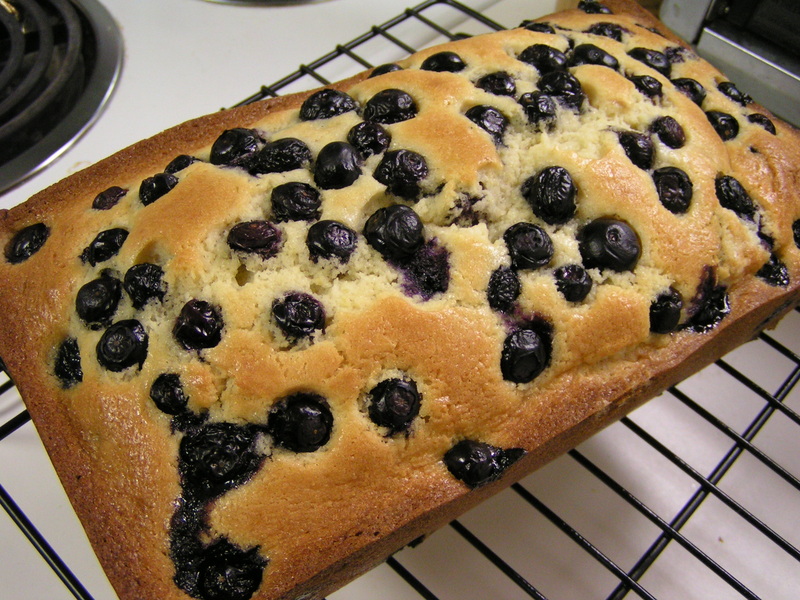 Scrape the batter into the prepared loaf pan, and sprinkle the remaining blueberries evenly across the top of the batter. Then bake 55 to 65 minutes, until the bread is golden brown. Cool in the pan about 10-15 minutes, then turn out and finish cooling on a wire rack so that the sides and bottom don’t become soggy. I heard it was good. Kids ate it all before I got to it!! Guess I will make you more then! And hide it from all Hubbys and large rodents!!! BTW, thanks for that link. WOW!!! Eye popping eye candy…with no calories. 🙂 Actually I think that might have just raised my heart rate enough to work off breakfast!